Alex Sparrow responded to the appearance on the web of provocative photos, on which he is seen passionately kissing with a bearded peasant. The actor showed the video of this kiss. Next, it will be even tougher, but you should never confuse actor with the character he is playing, "Alex wrote. It turns out that Alex starred in the American film UnReal. Provocative photos are stills from this film. "Yes, I had enough power to play the real drama of the world ballet star - an alcoholic-drug addict-bi in a steep American project," Sparrow said. According to Alex, before him, many first-class actors played gay in the cinema, being straight in real life. "Heath Ledger, Jim Carey, Colin Firth, Evan McGregor, Leonardo DiCaprio, Jude Law, is a list of actors who did this before me, and many others, perhaps, would like to, but were afraid that media will write about them. 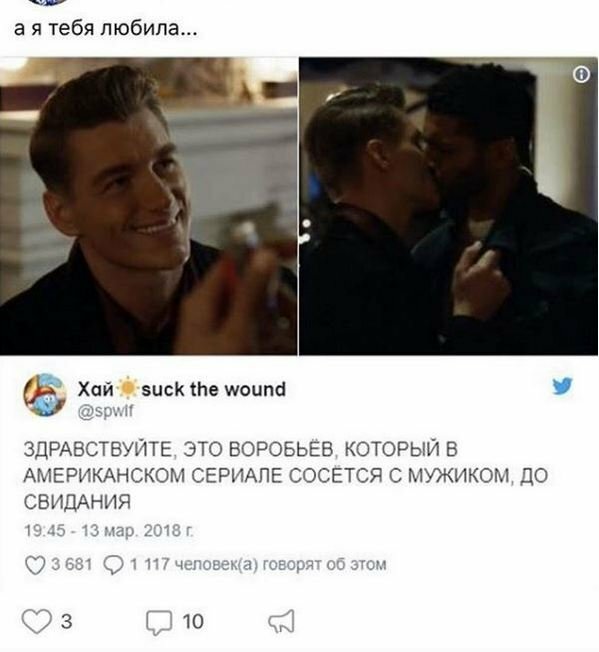 In the new season of the series "Unreal" Alex Sparrow plays one of the contestants of the show for acquaintances Alexei Petrov - drug addict dancer. For the coveted role, the Russian had to not only change the hair color, but also lose weight. "My character is the most unpredictable hero of this season, a man of insane talent, passion and love for his cause, but he is a man with an incredible inner drama, in the final stage of self-destruction," Alex said.